Sydney Sixers 5-185 (Moises Henriques 49*, Shane Watson 46, Ravichandrean Ashwin 2-32) beat Chennai Super Kings 9-171 (Suresh Raina 57, Faf du Plessis 43, Henriques 3-23) by 14 runs. A cracking all round performance by Moises Henriques assisted Sydney Sixers to win against the mighty Chennai Super Kings in the Champions League Twenty20. Sydney Sixers piled up 185 runs with half of their wickets still in hand at the end of the metered 20 overs. Chennai Super Kings did their best while chasing a mammoth total but fell short of 14 runs in the end. Moises Henriques (Sydney Sixers) was declared ‘Player of the match’ for his brilliant unbeaten 49 followed by three important wickets while bowling. The first match of Group B, in Champions League Twenty20 was played on Sunday, October 14, 2012, at New Wandrers Stadium, Johannesburg. MS Dhoni won the toss for Chennai Super Kings and asked his rival team, Sydney Sixers, to bat first. 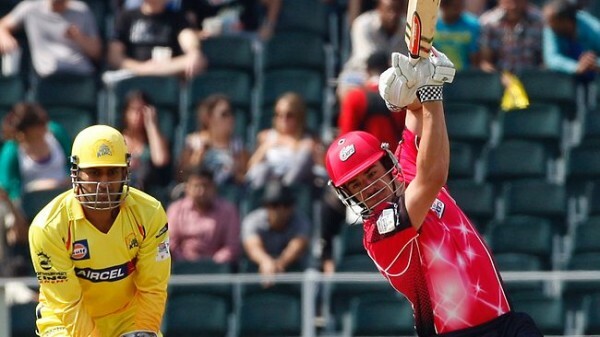 Michael Lumb and Shane Watson went off to a slow beginning and got five runs in the initial two overs. Watson opened up and got 3 fours in the next two overs while Lumb joined him in the fifth over with 1 six and 1 four. Watson continued with his aggression and the fifty of the innings was accomplished in six overs. Michael Lumb was declared leg before wicket off Ravindra Jadeja on the first ball of the following over for 18. Shane Watson hit a couple of sixes before he was run out for 46 off just 30 deliveries with 2 sixes and 5 fours as the total touched 78 in 8.5 overs. The middle order batsmen provided a minor contribution as Sydney Sixers lost their fourth wicket at 110 in 13.3 overs. Steven Smith and Moises Henriques joined together, enhanced the scoring rate and added 13 runs in the 17th over with 2 fours. Henriques was the most fierce of the two and dispatched 3 giant sixes and 4 fours in the last three overs. The speedy fifth wicket resulted in 75 runs off 39 mere balls as Steven Smith was gone on the last ball of the innings for 26. Moises Henrique remained unbeaten for 49 off just 23 balls with 3 lofty sixes and 5 fours as Sydney Sixers plundered 185 runs after losing five wickets in 20 overs. Ravichandran Ashwin left an impression by taking two wickets whereas Ben Hilfenhaus and Ravindra Jadeja shared one wicket each. Chennai Super Kings lost their opener, Murali Vijay, at just three runs when his stumps were broken by Mitchell Starc. Faf du Plessis associated with the other opener, Michael Hussey, and added 12 runs in the fourth over with 1 six and 1 four. Faf du Plessis hit 3 fours in the next over followed by another six and a four in the sixth over. He tried to continue with the offensive batting but was caught by Starc off Pat Cummins for 43 off 25 with 2 huge sixes and 5 fours. The second wicket was lost at 64 and three runs later Michael Hussey went back to the pavilion for 16. Suresh Raina secured his end while adopting a positive approach but found little assistance from the other end. He got 12 runs in the 11th over with 1 six and 1 four and collected 25 runs in the following three overs with 1 six and 4 fours. The hundred of the innings was achieved in the 13th over and Raina notched his 19th T20 fifty in the 16th over. He was caught by Steven Smith at long-on off Moises Henrique for 57 scored from 33 deliveries comprising 2 mighty sixes and 8 fours. The late order batsmen did their best but the wickets kept on slipping from their hands at regular intervals. Chennai Super Kings fought well but managed 171 runs with just one wicket left in the desired overs. Mitchell Starc and Moises Henrique were the main strikers with the ball and grabbed three wickets each. Pat Cummins, Shane Watson and Steve O’Keefe assisted well by claiming one wicket each. Sydney Sixers won the opener decisively by a margin of 14 runs and got four important points.